Bastian Schweinsteiger and Xabi Alonso are incompatible. Kevin De Bruyne is most definitely the real deal. Xabi Alonso (left) with teammate Bastian Schweinsteiger (right)... Bayern's odd couple. 1. Bastian Schweinsteiger and Xabi Alonso are the Bayern Odd Couple. After remaining unbeaten in the first-half of the season, league leaders Bayern Munich crashed back down to earth with a 4-1 hammering at a second-place Wolfsburg and one of the key reasons for the debacle was the dysfunctional relationship in central midfield of the veteran German and Spanish internationals. Despite Bayern boss Pep Guardiola insisting during the winter break that the pair of world champions could flourish in tandem, events in VW City emphatically proved otherwise. The pair are just too similar in style and against Wolfsburg were often standing on each other’s toes. 2. Kevin De Bruyne is most definitely the real deal. The real deal? Most definitely. Wolfsburg’s Kevin De Bruyne ran the show against Bayernm. According to German football bible, Kicker, the Belgian creative midfielder is the only player in the Bundesliga worthy of the world-class tag and on the evidence of his brilliant display in Wolfsburg’s remarkable dismantling of the Bayern machine, that assessment is 100 per cent correct. With Bayern in hari-kari mood – pushing too many players forward and frequently giving the ball away cheaply – the Wolves must have thought Santa was back in town and in the speedy, skilful and quick-thinking red-head had the perfect man to lead the counter-attacking charge, scoring twice and setting up another. “Often he was all on his own running at me,” moaned Bayern keeper Manuel Neuer, who in one unfortunate 90 minutes, conceded as many goals as he had in the entire “Autumn Championship”. Bought for £18 million from Chelsea a year ago, he spent his first six months combining the exceptional with the disinterested, but this term has been all-action throughout, as ready to put in a defensive shift as to turn on the style. 3. Patience is beginning to run out in St Kloppo. 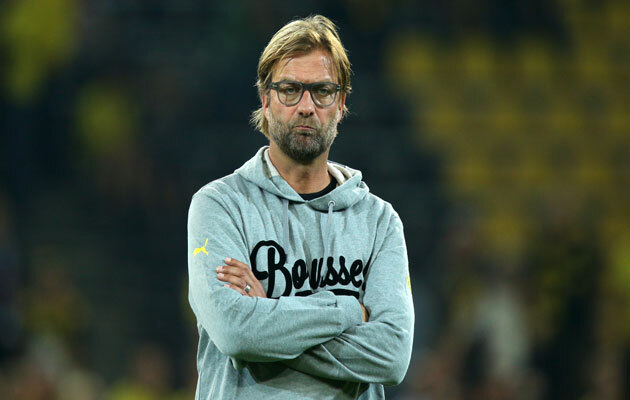 Patience is running out for Dortmund’s Jurgen Klopp. Compared to their hellish pre-Christmas domestic form, Dortmund’s hard-fought goalless draw at high-flying Leverkusen should have prompted a few more smiles in the Yellow-and-Black camp. But when you are in a relegation scrap, the only thing that matters is the bottom line and with Freiburg hammering Frankfurt 4-1 on the banks of the Dreisam, Jurgen Klopp’s boys are now rock bottom again. While the Dortmunder played with spirit and good body language, creatively, they were not at the races and the over-reliance on long-balls and penchant for imprecise passes does not augur well. For most of this season, harsh criticism of Klopp has been taboo. Yet slowly but surely, cracks are appearing in the cult of the bespectacled one. 4. Hamburg’s last chance goes by the name of Ivica Olic. Beaten 2-0 at home by an effective but hardly scintillating Cologne, the former European aristocrats of Hamburg have now lost nine games this term and continue to pay a heavy price for their lack of a decent defensive midfielder and their powder-puff attack, a unit – if you could call it that – which has only yielded nine goals in 18 matches. In order to augment their firepower, HSV recently rushed to the winter sales to snap up Croat international striker Ivica Olic from Wolfsburg and the hope is that the indefatigable little frontrunner will bring with him both finishing power and motivational spark. A cult hero in Hamburg during his previous spell there (2007-09), the 35-year-old very much looks the last throw of the dice. Werder’s 2-0 home victory over fellow strugglers, Hertha Berlin was the former’s fourth win in their last five matches at the Weserstadion and all the signs are that new coach Viktor Skripnik – who took over from Robin Dutt in October – is getting his sums right, even managing to squeeze out a clean-sheet from his usually careless defence.